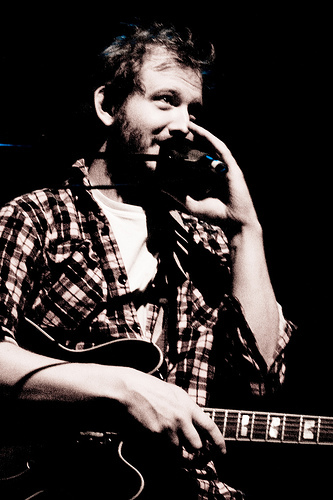 Bon Iver have just debuted their first track from their upcoming self-titled second album. It aired for the first time on Zane Lowe’s Radio 1 show not long ago, you can check it out over on his blog or below. It has been a long time waiting for the first track to surface from this highly anticipated album. All we have had before this was one of the best teaser videos we here at Hotcakes have ever experienced. That 50 seconds of video Justin Vernon released was an incredible bit of music. Unfortunately, ‘Calgary’ is not the full version of that clip, but a different song that reaches the highs and lows that you come to expect from Bon Iver. Starting with a simple note and Vernon’s voice, the song starts off with a much more studio-like sound to it, differing greatly from the first album For Emma, Forever Ago. The full album drops on June 20th. Pre-order it here. This entry was posted on 16 May, 2011 at 7:10 pm and is filed under Stream with tags bon iver, calgary, folk. You can follow any responses to this entry through the RSS 2.0 feed. You can leave a response, or trackback from your own site.